Sam Fleischner intends to take you somewhere, and though you may have been there before, it was never like this. Stand Clear of the Closing Doors shadows Ricky (Jesus Sanchez-Velez), an autistic middle school student, on a day he decides to follow an interesting pair of shoes rather than going home after school. This is, in a nutshell, the entire story. 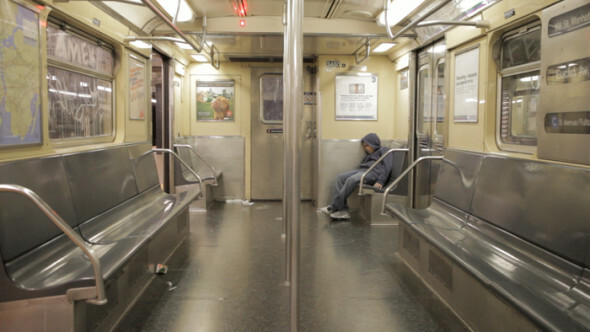 Ricky ends up on the New York City subway, and no one else is aware. As he spends days on end circling the city underground, we’re treated to the character study of a character we can’t really hope to understand. And yet, almost magically, it works. Though Fleischner has only one other directing credit, he’s logged some serious hours over the years as a cinematographer, a skill he puts to good use here. Rockaway Beach and NYC’s subway system provide not just backdrop, but become full characters in the film. Fleischner lenses the local flavors, color and sound in a way that is equal parts fascinating and terrifying, allowing us to experience them in just the way Ricky does. Meanwhile, above ground, Ricky’s overworked, undocumented mother – played with an authentic mixture of relentlessness, stoicism and anger by Andrea Suarez Paz – searches helplessly. A confluence of factors adds to the raising dread the film effectively develops, until you worry you’re trapped in a nightmare. It’s an absorbing hundred minutes or so, without a hint of hyperbole or a single false note – an honesty built mostly on Sandchez-Velez’s performance. The actor, making his screen debut, offers none of the dramatic flair associated with recent onscreen depictions of autism, possibly because he carries an Asperger’s diagnosis himself. The subdued sorrow he brings to the performance is heartbreaking. But you will need to be patient because Fleischner certainly is. Nothing is rushed, but everything matters: the newspapers littering the trains, the ads behind Ricky’s head, bumper stickers stuck randomly throughout the tunnels and trains. The film is asking us to lose ourselves the way Ricky has, but to notice things, too, just as he does. It’s a rewarding and frightening experience. In fact, the quiet brilliance of Stand Clear of the Closing Doors is that it is so honestly observed that it feels universal. ← It’s a Jersey Ting!